If you can see this. 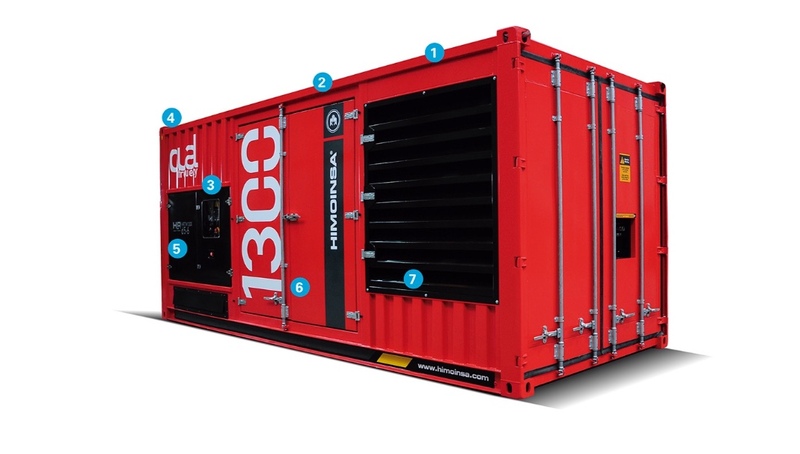 Power Cubes are 500kVA generator sets in 10 ft containers. They feature a type V MTU engine and a remote cooling system installed on top of the canopy to optimise space. Specifically, their compact size, low noise emissions and guaranteed good local technical service were decisive factors in winning this project. This website uses its own and third party cookies to optimize your navigation, suit your preferences and perform analytical studies. By continuing to browse confirms that it has been informed and accepts cookies. Click OK to close this message. HIMOINSA S.L. respects the privacy of users and makes every effort to comply with all legal data protection provisions, in particular, the provisions of the General Data Protection Regulation (EU) of 27th April and other applicable regulations. Address: Calle Edison, no. 57, Polígono Industrial Las Mezquitas, Getafe (Madrid). Postcode: 28906. HIMOINSA S.L. will request explicitly and openly that you provide the following information: name of the company (company name), address, post code, town, province, country, telephone and fax number, email address, website, sector and main activity, and the contact person’s position in the company. Whenever you wish to do so, you can update this information through the portal, providing an email address and a password. obtained following your registration as a registered user, will be used to carry out advertising campaigns, commercial communications, send product news and information, technical and safety notices on the operation or use of any products, promotional offers, and more broadly, perform market segmentation, commercial prospecting and internal sale reviews for the company. Consequently, you are hereby advised that the personal data provided by users will be used for sending commercial or promotional communications, for the purposes described, by any means, including sending messages through any system including SMS, fax, email, social networks, etc, that may be of interest to you, to expand and improve our products, adapting our offerings to your preferences or needs, based on reviewing and segmenting any personal and commercial information that we record in our files as a result of your access to the portal, as well as allowing for customised navigation. 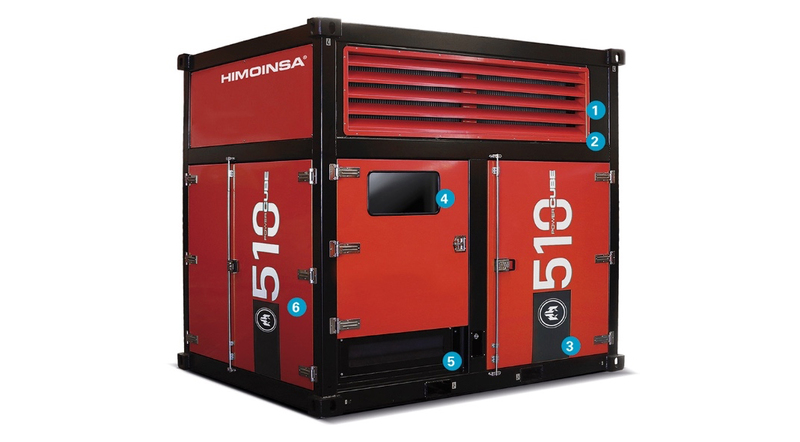 Any commercial communications made, will be done so in relation to HIMOINSA S.L.’s main company purpose and that of the companies forming the group, which currently is the manufacturing and marketing of generators, marine engines, compressors and portable lighting towers. We will also collect data from the contact forms in order to reply to your request or process your suggestion and solely for those purposes. If you send us a CV we will use the data it contains in the next selection processes. The website servers will automatically detect the IP address and domain name used by the user. An IP address is a number automatically assigned to a computer when it connects to the Internet. All this information is recorded in a duly registered server activity file which enables further data processing in order to obtain strictly statistical measurements allowing us to become aware of the number of page impressions, the number of visits to the web services, the order of those visits, access point, etc. Notwithstanding that the Spanish Data Protection Agency considers the IP address to be personal data, the owner of the portal cannot acquire any information about the owner of the Internet connection to which it corresponds, by itself, nor does it intend to do so, unless it has been harmed. This data will be stored and used only for monitoring and compiling access and website visit statistics, and in no case will be communicated or transferred to third parties. We will preserve the data during the entire duration of the business relationship with us and subsequently for any period that is essential for complying with any necessary legal obligations. In the case of the CVs and job applications, these will be retained for a maximum of two years following receipt, after which they will be destroyed. In cases where you revoke the consent you previously granted to some type of processing or exercise your right to erase your personal data, please bear in mind that we are required to retain said blocked information, to make it available to any courts, tribunals and bodies with jurisdiction, during the legally established limitation periods for addressing HIMOINSA’s possible liabilities, arising from processing your data. In the case of customers and suppliers your contact details and the information supplied by you in the course of contractual performance which are necessary to activate the business relationship. In the case of CVs and job applications we will base any processing on the data subject’s consent, insofar as they have supplied their CV to us voluntarily and subsequently on the possible pre-contractual relationship, if it is included within our company’s recruitment process. - In the case of contact forms where THE USER provides their data to obtain information on HIMOINSA’s products or for any other matter that does not give rise to a customer/supplier relationship, the data collection form will contain an authorisation clause whose acceptance will mean that they give their full consent to the automated processing of the data provided, in accordance with the data protection act. It will be understood that you accept these conditions if you press the "SEND" button which can be found on the data collection form, beside the consent clause. HIMOINSA S.L. will not make your personal information available, except where: (1) It is required by the competent authorities and to comply with our legal obligations. (2) It is necessary to protect the interests of other users. (3) In cases involving other companies of the HIMOINSA group, but always covered by the warranties mentioned in this statement and for the purpose of managing commercial relationships. collecting personal data, in relation to the same goods and services and in particular with the aim of enabling commercial relationships in the countries of destination always at the request of the data subject. For the purposes of this data protection notice, companies in which HIMOINSA S.L., directly or indirectly owns at least twenty-five percent (25%) of the voting rights in accordance with its stake in the share capital or due to an agreement with other members and where they have the right to appoint or dismiss, or where it has exclusively appointed using its votes, at least one quarter of the members of the board of directors, or where they exercise, either in fact or in law, a sole directorship, as well as those companies that, indirectly or indirectly, have these rights, or powers, or where said appointments have been made, or where these executive powers are exercised in respect of HIMOINSA S.L., are considered HIMOINSA Group companies. Subject to the above, HIMOINSA Group companies are currently found in Spain, France, Portugal, Poland, Federal Republic of Germany, United States of America, People's Republic of China, United Kingdom, United Arab Emirates (Dubai), Republic Argentina, India, Dominican Republic, Singapore, Panama, South Africa and Australia, therefore you are expressly advised that those countries that are not members of the European Union do not offer a protection levels comparable to those provided by Spanish legislation. Prior to transferring any kind of data, HIMOINSA SL undertakes to comply with all the legal requirements in the case of data transfers to companies located in countries that do not provide protection levels comparable to that provided under European rules. As additional warranty for the user or data subject, those companies of the HIMOINSA Group transferring data, hereby record that, for each batch transferred by the party acting as the transferor entity thereof, the rights to access, rectify, erase and object, as well as limiting processing and portability can be exercised. Those data processing activities based on consent will allow for the revocation of any consent previously granted to that end without it affecting prior transactions. Registered users warrant and will be answerable, in every case, for the accuracy, validity and authenticity of the personal data provided, and undertake to keep it updated, exonerating HIMOINSA S.L. from any liability for the same. The registered user agrees to provide complete and accurate information on the registration form. HIMOINSA S.L. reserves the right to exclude from the registered services any user who has provided false data, without prejudice to any further actions stipulated by law. In accordance with the legislation currently in force, a registered user may contact and exercise their rights of access, rectification, erasure and objection, as well as those of rectification and portability by regular or certified post addressed to HIMOINSA S.L., clearly indicating data protection, to Ctra. Murcia-San Javier, km. 23,600, post code 30730, San Javier (Murcia). They can also contact us at the e-mail address "privacy@himoinsa.com". To exercise these rights, it is necessary that you can prove your identity to HIMOINSA S.L., and, therefore, any application must contain the following information: The User’s name and surname, postal address, photocopy of their National Identity Document or passport, and the request expressed in the application. In the case of representatives, [powers representation] must be proven through reliable documentation. We also inform you that you have the right to make a complaint to the Spanish Data Protection Agency (www.agpd.es) if you believe your rights have not been respected. In any event, HIMOINSA will attend to your request in strict compliance with the data protection regulations and with the utmost respect for the confidentiality of the same.